Re-architect is created and played on 7scenes. 7scenes is a mobile and online platform to create, play and share GPS games and tours. With 7scenes it’s easy to set up location-based experiences that can have a range of different rules of interaction: from complex multi-user role playing games to interactive treasure hunts to media-rich cultural tours. Check out the 7scenes website for more info. Soon the making of – from a tech point-of-view – will be posted on this page. First you need a mobile phone with java support like a Nokia N95, N96 or N82. The 7scenes application can be downloaded by visiting http://m.7scenes.com with the browser on the mobile telephone. There you will find a download link – click that link to automatically install the application. Access point: Select the GPRS access point of your provider. The application will work without these settings, but you will get annoying popups, so it’s better to make these adjustments. When you start the application, you will be directed to the ‘Profile’ screen. Enter your username and password – don’t have one? request one at info[at]7scenes[dot]com. Once you entered the username and password, the application will automatically log in, and take you to the main ‘Scenes’ screen. The navigation works as follows: use the ‘softkeys’ (on the N95 the two blue buttons, right under the screen on the left & right) to show the main menu (horizontal, at the bottom) and the ‘options’ submenu (vertical, on the left – not all screens have an options menu). 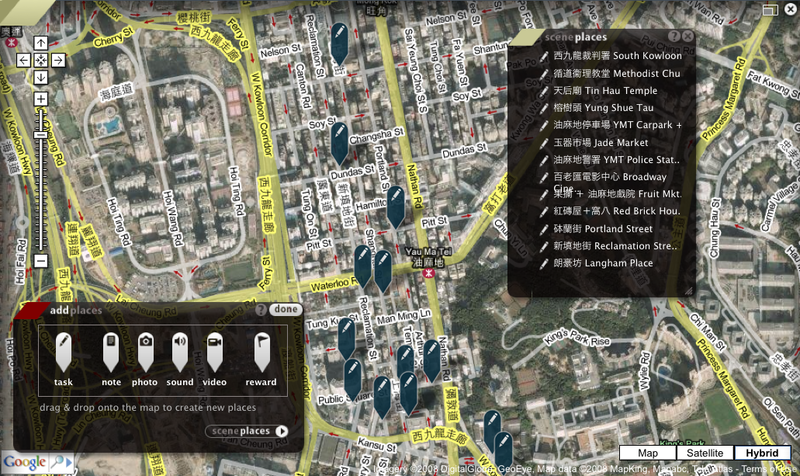 Once you select a Scene (there should be 1 Scene “Re-architect Hong Kong”), you will be taken to the Scene navigation. When the GPS has established a fix, you will be shown a map, with the first point shown as a small blue marker. The “Options” menu allows you to zoom in and out on the map. Once you hit the first point, the second one should appear, and so on until you reach the final point on the route.